The Republic of Equatorial Guinea was elected to the Executive Board of the United Nations World Tourism Organization (UNWTO) at the 22nd session of the General Assembly of the World Tourism Organization (WTO) in China. Equatorial Guinea was nominated and elected to the Executive Board, along with Cape Verde, Namibia, the Republic of Congo, Sudan, and Zimbabwe. The Director General for Tourism Promotion and other delegates from the Ministry of Tourism of Equatorial Guinea attended the session, which focused on the ethical code for tourism into an international convention, as well as the influence of technology on the tourism sector. The session, which included more than 1300 delegates from 130 countries around the world, was held from 11 to 16 September in Chengdu, China. 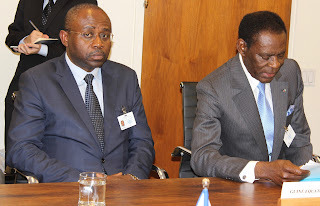 The Vice President of the Republic of Equatorial Guinea, Head of State Defense and Security, Teodoro Nguema Obiang Mangue, strengthened national security as chair of the recent meeting of the Directing Council of the Ministry of National Defense. The Vice President reviewed the functioning of the department, as well as directed new orders for the short, medium, and long term for matters of national security. The Vice President also reviewed the responsibilities and assignments of the deputy minister and secretary of state. The meeting was also attended by the Minister of National Defense, Juvenal Mbomio Nsue, the Deputy Minister, Lucas Obama Ndong, the Secretary of State, Alfredo Abeso Nvono Onguene, and other high-level military officials of the National Army. The meeting took place on 21 September at the Ministry of National Defense in Malabo. Equatorial Guinea called for reform of the United Nations Security Council as part of “a united, dynamic and coordinated action of all nations.” President Obiang Nguema Mbasogo told the United Nations General Assembly [today] that the country would carry this philosophy to the Security Council as one of its newest non-permanent members. “We want cooperation to balance in terms of equity. We want to respect the principles and cultural values ​​that guarantee the existence of each nation through time, which will lead them toward sustainable development and the achievement of the 2030 United Nations Agenda and 2063 of the African Union Goals,” he said. President Obiang Nguema Mbasogo addressed the 72nd Session of the United Nations General Assembly in New York amid a busy series of meetings, including the Security Council Summit between Japan and Africa, where Obiang asked for the dismantling of nuclear weapons in order to achieve true world peace. He also attended the Community of Portuguese Language Countries (CPLP) Summit, where he highlighted how Equatorial Guinea’s Horizon 2020 development program has allowed the country to move toward its goals of becoming an emergent economy. While in New York, President Obiang met with world leaders, including United Nations General Assembly president of the 67th Session, Vuc Jeremic and former president of the Burkina Faso Republic, Michel Kafando, and described his new mission as intermediary in the Burundi political conflict. Equatorial Guinea hosts a number of United Nations programs, including the United Nations Population Fund (UNFPA), UNICEF, and the UN Development Programme (UNDP), which has conducted a national census with funding from the government. Equatorial Guinea Joins CPLP Countries at New York Summit. President Obiang Nguema Mbasogo highlighted how Equatorial Guinea’s Horizon 2020 development program has allowed the country to implement their goals toward an emergent nation, during the Community of Portuguese Language Countries (CPLP) Summit held in New York this week. maintaining a dialogue between the socio-political players, in order to overcome circumstantial factors that slow down the development of countries. During the meeting, President Obiang Nguema Mbasogo and his counterparts discussed implementation of the United Nations 2030 Sustainable Development Goals. The President of the Republic of Equatorial Guinea Obiang Nguema Mbasogo is set to attend the 72nd Session of the United Nations General Assembly (UNGA). 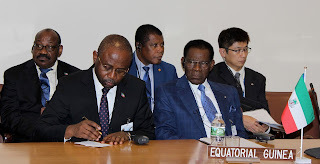 The Equatorial Guinea delegation, led by President Obiang, will join other Heads of State and Government, Vice Presidents, Prime Ministers, Ministers of Foreign Affairs, and their delegations to discuss issues of international peace and sustainability. Equatorial Guinea is a fully-participating member of the United Nations (UN) and active on the international stage. 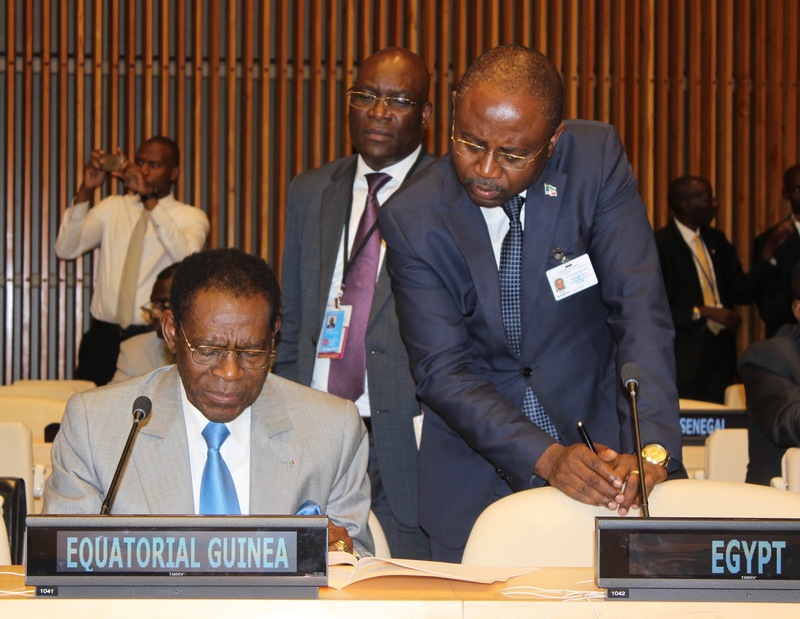 Equatorial Guinea was recently elected as a non-permanent member of the UN Security Council (UNSC). Equatorial Guinea hosts a number of United Nations programs in its territory, including the United Nations Population Fund (UNFPA), UNICEF, and the UN Development Programme (UNDP), which has conducted a national census with funding the government. In addition, Former UN Secretary General Ban Ki-moon visited Equatorial Guinea during the African Union Summit in 2014, and dedicated a new UN building alongside President Obiang to house all UN agencies in the country. The UNGA will open on 19 September in New York City, and will focus on the theme Focusing on People: Striving for Peace and a Decent Life for All on a Sustainable Planet.